Sellers must realize that when overpricing your home, that it doesn’t matter what the inside looks like or what it has, nobody will come to see it. Agents must properly coach their selling clients on the importance of proper pricing to ensure their clients goals are meet. Seller should also do their due diligence so that they’re not caught in the trap of agreeing to a higher price with an agent that is presenting a false expectation. When an agent decides to take a listing just to have it in their inventory they’re doing a huge injustice to themselves and their client. Sellers who begin with the high hopes of obtaining the highest price in the area on their property should be prepared to have their bubble burst! Obviously there’s a HUGE difference between listing a home for sale and actually selling the home. 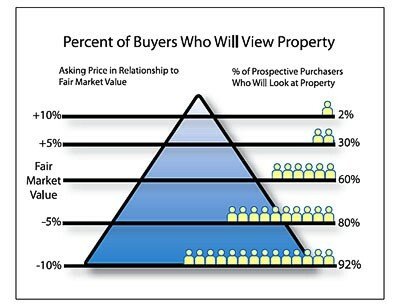 Price is the single most important factor of putting a home up for sale on the market and it alone will determine your days on market or DOM that it will take to sell the home. The cause and effect of pricing a home is as follows; sellers motivation and reality – listing price – days on market. The more motivated and realistic a seller is to sell then that will be revealed in the listing price of the home on the market. When Overpricing Your Home, Beware! Most of the time you have a buyers agent and a sellers agent also known as a listing agent. Despite what many people believe, a listing agent (the agent that has your home listed) probably wont be the person who sells the home to a buyer. The listing brokers job is to market your home to the public and other agents in the territory and most of the time as a result of these marketing campaigns agents will bring their buyers to the home to preview it. Be patient through the first couple weeks but be ready, the first two weeks of a newly listed property probably wont bring a flurry of buyers as it does take some time to get the marketing and advertising out to the masses. One thing to be mindful of though is the first 2-6 weeks a property is listed. This is a critical time and when most of the traffic on your home will take place. Don’t be surprised if you get an offer within the first 2-6 weeks of your home being listed as this is normal if the marketing was a success. Now keep in mind pricing is the most important so if a property isn’t priced properly regardless of the marketing, the home wont sell and likely wont even receive any offers. Providing the property has been properly priced you will see the traffic and sell your home. However, if you as the owner have not followed the most important rule and listed the property over the fair market value then you simply will not see the traffic we spoke about earlier. For more information on the importance of not overpricing your home, please contact us or leave a comment below. We’d appreciate the opportunity to assist you!